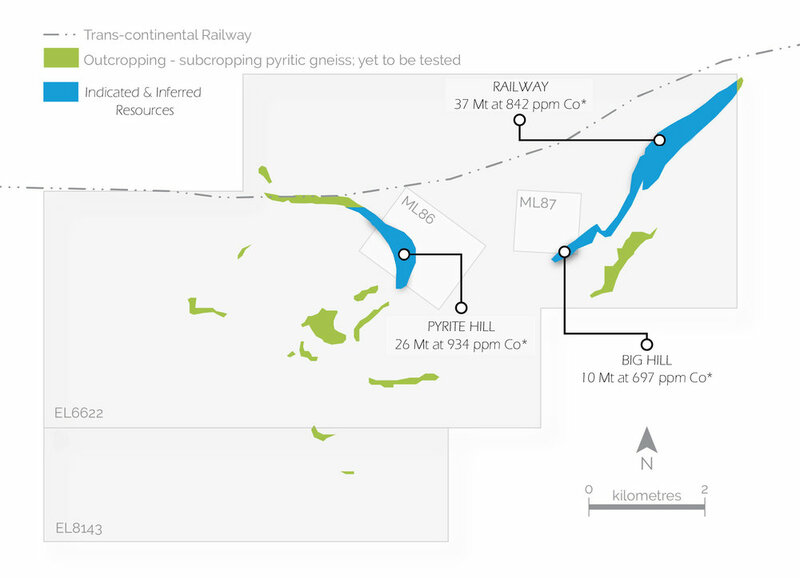 The Thackaringa Cobalt Project is strategically located 25km southwest of Broken Hill, New South Wales, adjacent to the main transcontinental railway line (Figures 1 & 2). Mineralised outcrop extends for over 10km, with less than a quarter of this trend having been drill tested. A major resource drilling campaign of over 15,000 metres is underway at Thackaringa to increase the overall Mineral Resource base and define a component of Measured Resource, supporting ongoing Feasibility Studies. The Thackaringa Cobalt Project is under a Farm In and Royalty Agreement with Cobalt Blue Holdings Ltd (COB). COB has ceased earn-in to the project at a 70% beneficial interest, leaving BPL with a 30% beneficial interest in the Cobalt Project and 100% legal rights to the exploration leases. In addition, BPL will receive a 2% net smelter royalty on all cobalt produced from the Thackaringa tenements for the life of mine. BPL retains the base and precious metal exploration rights over the Thackaringa tenements, where it is actively exploring for a diverse range of deposit types including Broken Hill (Pb-Zn-Ag) style mineralisation. Cobalt is a necessary metal for the production of the latest generation, high density Lithium-ion batteries. Due to its high run-time properties, the use of cobalt has risen dramatically as portable Li-ion battery usage accelerates and electric vehicles become a reality. Thackaringa has the potential to be a World Class source of cobalt largely independent of the supply/demand cycles of metals such as nickel and copper inherent in the global cobalt market. A major step forward in the project’s viability occurred in early 2018 with release of a new Mineral Resource estimate — the culmination of two successive resource drilling campaigns in 2017 for a total of 20,444.8m. 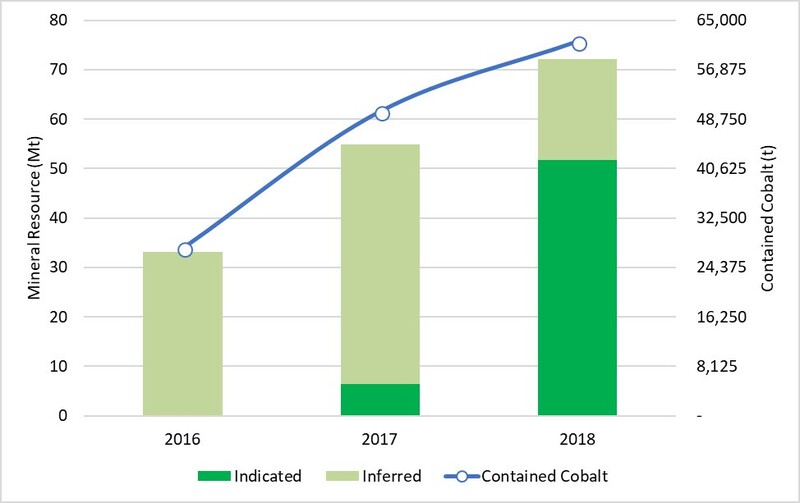 The second program in late 2017 (74 holes for approximately 12,500m) delivered a 31% increase in total tonnes and a 23% increase in contained cobalt (now 61,500 tonnes) compared with the Mineral Resource estimated in June 2017 (Figure 3). 72% of the Mineral Resource is classified as Indicated, which reflects improved geological confidence. The Mineral Resource estimate is contained in three main deposits: Railway, Big Hill and Pyrite Hill (Figure 2), and is detailed in Table 1. Simplified geology plans and representative cross sections though the three main deposit areas are presented in Figure 4. The Thackaringa Cobalt Project remains on target to become a world-class cobalt producer, with recent metallurgical testwork highlighting 88% cobalt recoveries from ore to high value cobalt sulphate product. The TJV remains focussed on completing a maiden Ore Reserve estimate as part of the Preliminary Feasibility Study.